Born at Edmonton, Alberta on 9 August 1915, he served in the RCAF in the Second World War. In March 1946 he founded radio station CJOB, selling it in 1961. He introduced many broadcasting innovations to CJOB, including news on the hour and simultaneous FM broadcasting (1948). 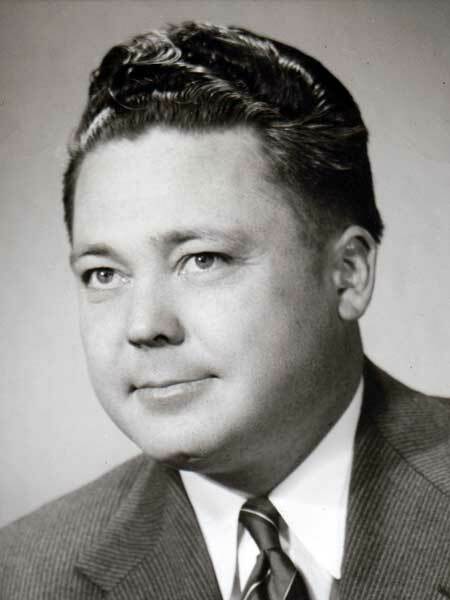 He was also associated with stations KCND-TV in Pembina, North Dakota and CFRW in Winnipeg. He was active in numerous community organizations, including the Canadian Association of Broadcasters, Western Association of Broadcasters, National Federation of Sales Executives, Industrial Development Board of Greater Winnipeg, Winnipeg Chamber of Commerce, Manitoba Highway Safety Council, St. John’s Ambulance, Royal Winnipeg Ballet, Contemporary Dancers, Boy Scouts’ Council of Manitoba, Kiwanis Club, Shriner’s Khartum Temple, Fellowship Club, Canadian Red Cross Society, Humane Society, Carleton Club, Royal Commonwealth Society, Air Cadet League of Canada, Manitoba Aviation Council, and Wartime Pilots and Observers Association. He died at Winnipeg on 20 February 1981. He is commemorated by Jack Blick Avenue in Winnipeg. “CJOB founder Blick dead at 65”, Winnipeg Free Press, 21 February 1981, page 17. Obituary, Winnipeg Free Press, 23 February 1981, page 41. “Blick’s radio dream came true in CJOB”, Winnipeg Free Press, 25 February 1981, page 74.